Winter, 1972. Ingrid and I, along with another couple, David and Donna, had rented a small house in the interior of British Columbia. We planned to do a month-long retreat while we waited for spring and for Kalu Rinpoche, our teacher, to visit Vancouver for the first time. It was the usual retreat mess. We woke every morning to a freezing cabin. David and I would trudge out into several feet of snow and spend half an hour splitting stove-wood for the day. We took turns cooking. We practiced four sessions every day, except on days when we ventured to town for supplies. Ingrid was ill with strep throat for most of the month. David kept in touch with world news, which invariably depressed him. Donna plugged away at prostrations, nursing sore knees and sore arms. And I . . . My practice was Chenrezi, meditation on the embodiment of awakened compassion, a deity visualization and mantra practice in the Tibetan tradition. And I couldn’t do it. I couldn’t visualize. I couldn’t see myself as Chenrezi. I couldn’t feel anything resembling compassion for the beings in the six realms of existence. My legs hurt, and I was in constant pain. For me it was a miserable disaster—unpleasant, confusing, and disappointing. In desperation, I started to pray. I did not know to whom or what I was praying. I’m not even sure I knew what I was praying for. I just prayed. The act of praying made a difference. It brought a little clarity and a little space into my confusion, and I found a way to continue. By making prayer a part of my daily practice, I discovered a new possibility: faith, a quiet source of strength that became vitally important to me in the years ahead and helped me many times to keep going in difficult situations. By faith, I do not mean belief in something for which there is no evidence. I mean the willingness to open to whatever arises in our experience. Prayer is an important element in the Tibetan tradition of Buddhist practice, and there are many forms of prayer: prayers to one’s teacher, prayers to the buddhas and bodhisattvas, prayers to one’s yidam, or meditation deity, and all sorts of different kinds of prayers to the protectors. There are aspirational prayers, confessional prayers, offering prayers, prayers of praise, teaching prayers, dedication prayers, good-fortune prayers, healing prayers, and so on. The Tibetan language has different words for these different kinds of prayer, but in English, we use the one word prayer to cover them all. The kind of prayer that has been most meaningful to me might be called supplicatory prayer. It plays a central role in the practice of guru yoga in which you use prayer and devotion to join your mind with your teacher’s mind. That joining acts as a kind of bridge to awakening into direct awareness. During another retreat, a few years later, I discovered how this form of practice could bring about levels of insight and clarity that had been previously inaccessible to me. Here is the prayer that I used. I have repeated it literally hundreds of thousands of times, and still return to it again and again. Treasured teacher, I pray to you. Give me energy so that belief in self falls away. Give me energy so that I see through life’s illusions. Give me energy so that reactive thinking comes to an end. Give me energy so that I know mind has no beginning. Give me energy so that confusion resolves itself. Give me energy so that whatever arises is experience beyond words. In connection with the practice of joining your mind with that of your teacher, there are endless exhortations about devotion, about faith, and about the sanctity and inviolability of the teacher-student relationship. There are also aspects of this practice that many in the West have found confusing: the idea of praying to a living person—someone you actually know—and instructions to see this person as a buddha even when his or her humanity, limitations, and failures are all too apparent. These issues arise largely because in our culture we are conditioned to view all relationships solely in human terms. We have lost the possibility of having a both a symbolic and a human relationship with the same individual. As many of my teachers demonstrated, in Tibetan culture people could have a close emotional connection with their teacher and that emotional connection was carried seamlessly into their spiritual relationship, even though the spiritual relationship stands outside of time and ordinary human interaction. Their relationship with their teacher was something they truly treasured. In today’s world, psychological views on transference and projection, neurological theories on brain functioning and cognition, and the pervasive tendency to see all relationships only in human terms have made the path of prayer and devotion suspect. The loss is ours. This suspicion has delegitimized the experience of more than a few practitioners and denied them access to a source of vitality in their practice. Yet prayer and devotion do provide ways for people to open to the depths of their being and to give expression to the joy and freedom in their hearts. For me, prayer is about reaching out. That is what I was doing in that snowbound cabin in BC. I was reaching out. Naturally one asks, “What are you reaching out to?” Even today, I have no answer to that question, at least no conceptual answer. For lack of a better term, I could call it the Great Other, a phrase the German philosopher Peter Sloterdijk uses in You Must Change Your Life. We are reaching out to something that is not us, at least not us as we know ourselves right now. It represents possibilities we can sense or intuit, even if we cannot conceptualize or understand them. In the Tibetan tradition, your teacher represents those possibilities, and you approach the teacher with a certain reverence or awe, however well you know his or her human foibles. When you focus attention on someone or something that inspires awe in you, you forget yourself. You also forget your self, and you may even forget your Self. One teacher advised me, “Forget about true or false, is or isn’t, this way or that way. Pray to your teacher until thinking stops and then rest there.” Because my own teacher had passed away many years ago, this teacher was directing me to pray where I felt a connection and to let the emotional energy of devotion take me beyond thought and thinking. This, for me, is the essential quality of prayer: a reaching out that moves us beyond our ordinary conceptual mind and our reactive emotional mind. It opens up possibilities that cannot arise when either of those minds is operating. It gives us access to a higher level of attention, a level of attention that draws energy from the direct knowing that is mind itself. Devotion is closely related to awe, where awe is a feeling of being intimately connected to something that is infinitely greater than you. When you feel awe, you become aware of the vertical dimension in life and devotion naturally arises. On a practical level, I do this by recalling the feeling of awe first, and then holding the feelings that arise in response in my heart. Those feelings may include a feeling of warmth, of opening, of weight or gravity, of joy, of freedom. They may also include fear and trepidation, pain and longing or humility and self-consciousness. Different people experience devotion in different ways. The main thing is just to hold all those feelings in your heart as you pray, and return to them whenever attention wanders. The words of a prayer can be helpful. You say the words, over and over again, and let them take root in your heart. At the same time, the repetition keeps your attention from wandering, and the meaning of the words gradually seeps into you and powers your prayer. Silent prayer is also possible, a prayer without words, a prayer which is more about holding a feeling of awe and devotion and reaching out from there. What words you use are not as important as the attitude of prayer itself. In this form of prayer, we are not praying for things. We are praying for energy, the kind of energy that arises when our hearts are open and we let go of our ordinary concerns. The words of the prayer give expression to our intention, our direction. Through the emotional connection of devotion, we let go of the reactive and conceptual minds and openings arise. Those openings do not come about through an act of will per se, but through the practice of prayer itself. When the feeling of devotion you engender through prayer is so intense that thinking stops, your heart opens and you have no choice but to trust the utter groundlessness of experience. You rest there speechless and without thought and other possibilities such as insight and direct awareness arise. There are, of course, other ways to create the conditions for such openings, but throughout history, prayer and devotion have been a reliable path for many. People often ask, “But in the end, aren’t you just praying to yourself?” The notion that you are praying to yourself is a mental conceit. It undermines prayer because it gives you a way of avoiding the challenge of stepping out of the way we ordinarily relate to life. Right now, we experience life, the world, ourselves, in a certain way. We practice because we are called to something that is fundamentally and radically different. Only when we acknowledge and respect that difference do we form a relationship with the possibilities represented in the Great Other. As long as you take the attitude that you are praying to yourself, or your self, or even your Self, any sense of awe will feel contrived, devotion will feel artificial and your prayer will be chained to the same conceptual mind that holds on to the idea that you are praying to yourself. Ultimately, yes, there is no difference between what we are and the Great Other. In the Cakrasamvara Tantra, for example, the key pointing-out instruction is “Your father is you.” But the Great Other is other—it is not knowable by the conceptual mind, and any effort to avoid that otherness is self-defeating. We have to start from where we are, not from where we would like to be. People often feel that their prayer and devotion is contrived, that it doesn’t spring naturally from their hearts, that they feel they are being inauthentic in this practice. 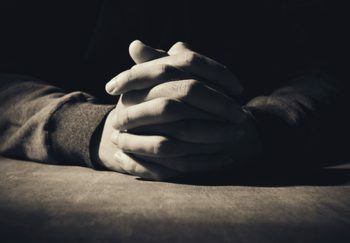 In the beginning, yes, prayer and devotion may well feel contrived for the simple reason that it is difficult for many of us to touch that place of devotion in our hearts. The key, at least for me, is to touch the place where I feel an intimate connection with something that is infinitely greater than I am—in this case, the inconceivable and infinite openness that is mind itself. Then, to the extent that I can, I let the prayer come from that heartfelt connection. That way of praying necessarily involves a letting go of the rational mind. It may feel as if I am stepping off a cliff into an ocean of feeling and experience that is deeper, vaster, and more unknown than anything I have encountered before. So be it. I take the step. When I do, I cannot hold on to the conceptual mind. I stop being able to think in the way I ordinarily do. Another reason why many people find it difficult to pray, I think, is that it is frightening to acknowledge and embrace the aspirations and inspirations, the disappointments and frustrations, and the dilemmas and possibilities we hold inside. We feel naked, exposed, with nowhere to hide, not even from ourselves. I have often felt that some practitioners use meditation as a way of avoiding prayer and its emotional challenges. They feel that meditation alone gives expression to what they are seeking, but they don’t necessarily touch the place inside from which that seeking arises. Meditation and prayer are intimately related and I think quite a few practitioners might find their meditation practice different—clearer and less of a struggle—if they spent more time touching directly what is in their hearts, giving verbal and physical expression to that in whatever ways come to them, in prayer, song, dance, movement, or recitation, and then sitting down to meditate. We reach out through prayer because we have to reach out. Something calls to us and we cannot avoid it. In response we experience nothing—complete and utter silence. That is the nature of the Great Other. The lack of response brings up anger, boredom, frustration, impatience, self-doubt, guilt, pride, fear, you name it. The eruption of such feelings is part of the practice of prayer. These reactive emotions are organized around a sense of self. They function to maintain it and the many illusions we have about life and who we are. These feelings return again and again, often at increasing levels of intensity, but devotion also makes a difference in our capacity to experience those feelings without falling into confusion. Prayer in the way I describe it here does nothing to reinforce our sense of who we are. It fails at that—utterly and completely—and we may feel abandoned, bereft, heartbroken, and lost. At the point when prayer seems futile and hopeless, when we feel we can no longer tolerate the raging of these reactive patterns, something else begins to form. As one practitioner said, “Gates look like corners, until you go through them.” Unexpectedly, we leave behind the world of emotional reactions. Uncontrived heartfelt devotion takes birth in our heart. If we are using an actual prayer, the words of the prayer take on a meaning that goes deep in our being. Each word, each phrase, rings like a bell. If you choose to do this kind of practice, know that that shift does not take place overnight. There may be long periods of arid practice that tax your motivation and devotion to the limit and beyond. Keep touching the place in you where faith and devotion reside. If that faith takes the form of a deep longing, then let that longing power your prayer. If that faith takes the form of confident understanding, then let that understanding power your prayer. And if your faith and devotion give rise to a clear and open mind, then pray from that open clarity, or however much of it you can touch in the moment. Prayer, in the way that I have tried to describe it here, leaves no traces. It acts like a fire, burning away our confusion. When we reach out to what is unknown to us, we let go of the notion that we can control what we experience. We leave behind the conceptual mind and the mind of emotional reactions. And we may end up exactly where we wanted to be: face-to-face with what is beyond ordinary understanding.